I’m grateful to have a lot going on in my business and life these days. Yet it can be overwhelming, and sometimes I’m not sure what to do with these competing commitments. It’s tough to acknowledge when I’m in a blogging slump, since I’m the one who’s supposed to have this blogging thing down. And I know better than to spend too much time taking you too far behind the curtain of my blogging habits. That’s not why you’re here. On the other hand, you need to know I’m not perfect at this – none of us can be. Several times this week I decided to take my own advice and put my blog writing time ahead of my client work. It felt incredible to let that momentum and accomplishment propel me through the rest of my day. By giving my blog writing the best part of my day, I’m showing myself, the universe, and my readers that this blog is a priority for me. Now this doesn’t mean I don’t do anything else during this energetic prime time, but by blogging first I’m taking a stand for myself and for the readers I’ll help with my blog posts. I often use a Pomodoro timer for these sessions. That means I work for 25 minutes and then stop for a 5-minute break. This is partly so I don’t get carried away and run out of prime time for other important tasks, and partly to force myself to stick with the writing process, even if I feel stuck or want to procrastinate. Here’s what Marie Forleo says about doing your creative work at the beginning of your day. I’ve said it before and I’m sure I’ll say it again – what gets scheduled, gets done. When I’m super-busy like I am now, I tell myself I don’t have time to plan my time. Yet it always backfires on me because it’s the planning that helps me get things done. It’s the structure that gives me freedom to adhere to my calendar and trust that things will be taken care of, knowing I can always adjust my plan if I need to. If blogging is on my calendar at the start of every work day, I don’t schedule meetings for that time, and I don’t count on that time for client or project work. Of course I can make exceptions, but when a blogging session is on my calendar I’m far more likely to reschedule it than let it fall through the cracks. When I feel intimidated by a big pile of dirty dishes in the kitchen, or unloading a week’s worth of groceries from the car, I often tell myself to just turn on my auto-pilot. Just put one foot in the front of the other and start. One dish at a time, they will all get clean. One bag at a time, they will all get into the house and be put away. Whenever I have a system or routine built around something, I can use this tactic. My muscle memories and habits take over, and the task is done before I know it. 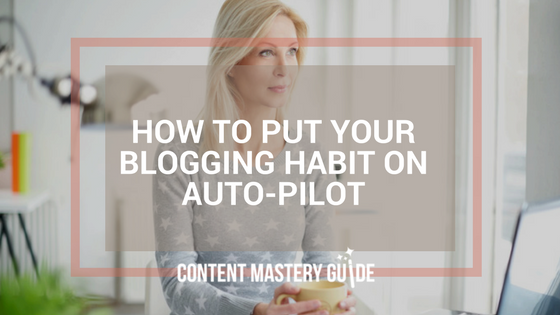 When it comes to blogging, I have a 7-step blog writing system in place, which means I can always turn on the auto-pilot and know which specific actions to take. One word at a time, a blog post gets written. Want to learn my 7-step blog writing system? Join my next free live online training, Write More, Earn Less With Blog Posts That Are Easy to Write and Irresistible to the Perfect Clients for Your Health and Wellness Business.